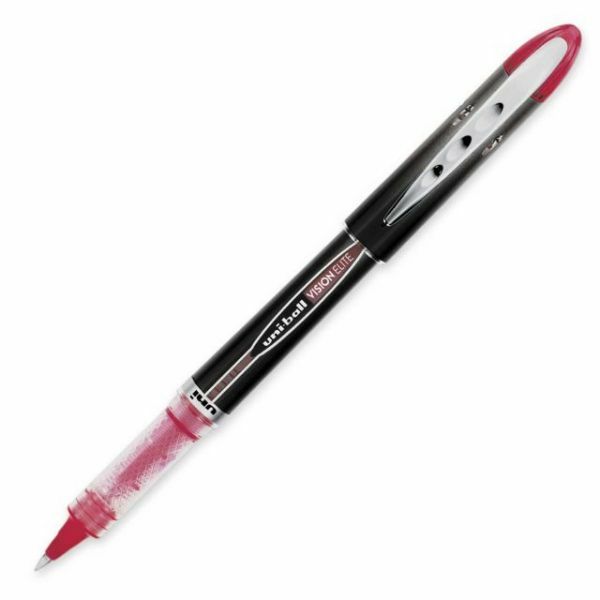 Rollerball pens produce smooth, consistent color. Airplane-safe pen engineered to eliminate leaks due to changes in cabin pressure. 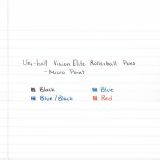 uni-flow Ink System for consistent ink flow and smooth writing. 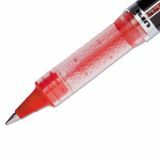 uni Super Ink provides 3-way protection against water, fading and fraud. Note: A minimum quantity of 432 must be ordered, and in units of 144 thereafter. 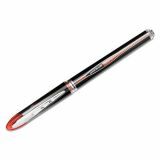 uni-ball VISION ELITE Stick Roller Ball Pen, Super-Fine 0.5mm, Red Ink, Black/Red Barrel - Vision Elite Rollerball Pen is ideal for business travelers because the pen won't leak with a change in cabin pressure. Delivers skip-free writing. Uncapped pen displays ink supply. Ink is acid-free, fade-resistant and water-resistant. Refillable. Contemporary design with metallic accents.